Avoiding rush hour traffic jams, safely and comfortably – cooperative driver-assistance systems are supposed to make this scenario a reality soon. Such systems can warn their drivers about unforeseeable situations like the end of a traffic jam behind a turn and then suggest alternative routes. The efficient communication technologies allow vehicles to communicate with other vehicles, as well as with the surrounding traffic control infrastructure. In this kind of communication process, each vehicle conveys anonymous data regarding its speed, its position or the traffic situation in its near environment. This data is then processed by intelligent driver assistance systems and – if required – provided to the driver. The foundation for these driver-assistance systems is a dependable and secure transmission of data between vehicles. With its V2X-testbed, Fraunhofer FOKUS, member of the Car2Car Communication Consortium, offers a test environment that is dedicated to this kind of communication and allows for testing the communication characteristics of cooperative V2X systems. Vehicle-to-X-communication not only offers higher safety in traffic but also increases comfort for drivers. However, only if the cooperative driver assistance systems fulfill quality standards and are interoperable, all traffic participants can make benefit from the technology. The Fraunhofer FOKUS V2X testbed enables systematic and automated testing of networked, cooperative driver assistance systems. It creates a flexible and expandable basis for conformance, interoperability and regression testing. The testbed furthermore allows the testing of V2X-systems with regard to their functional features, real-time behavior, stability, robustness, security and interoperability. In addition, the tests can be executed in a virtual environment without using dedicated communication hardware (virtual testbed). That way, testing can already be carried out in the early stages of software development and thus can be used to detect applications errors in the early development phases when hardware is only sparsely available. The FOKUS V2X testbed is flexible and configurable. It can realize and test different system configurations of individual vehicle systems (IVS), individual roadside stations (IRS), and traffic control centers. In this context, the customized user interfaces allow users to see both the technical communication details and the high level view on positions and velocities of the vehicles during the test scenario. The standardized test description language TTCN-3 guarantees an easy programming and automation of the testing procedure. Overall, Fraunhofer FOKUS' testbed guarantees the ideal test environment for the automatized testing of dispersed V2X-applications and V2X-systems. 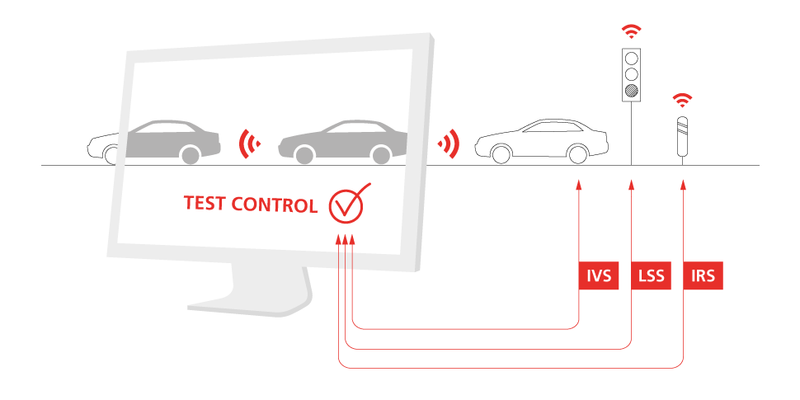 The technology thereby is an important contribution to the safe networking of future vehicles. The V2X testbed was developed with the research projects simTD, DRIVE C2X and PRE-DRIVE C2X. It was used in cooperation projects with partners from the automotive industry.